This decade has beenparticularly kind to George Takei. With his portrayal of LokDurd in this week's animated Star Wars: The Clone Wars,Takei has become the first major Star Trek actorto become part of the Star Warsuniverse. Then again, if that isn?t enough, he also has his recurring role ofKaito Nakamura in Heroes. ?In some ways, Heroes and Star Trek have a lot of tie-ins,? says Takei. ?Masa Oki, whoplays my son on Heroes is awidely avid Star Trek fan. Infact, the reason why I started watching Heroesis because fans emailed me to tell me one of the characters was a Star Trek fan. So I started watching andquickly got hooked on it. Then I got a call from my agent saying they wereinterested in me to play the father of Hiro Nakamura. ?So I went and met with TimKring, the guy who created Heroes,and I got hired. Then, on the set, I met a lot of people on the set and found agood number of them are really, wildly dedicated Star Trek fans. In fact, the prop master is the most avid ofthem all. He was the one who prepared a license plate in the limo my charactergoes around to have ?NCC 1701,? the registry of the Starship Enterprise.Another, a member of the writing staff, remembered my great sword fightingscene in Star Trek, so heworked in a sword fighting scene for Kaito Nakamura? So that?s how that scenein the first season came about. So there?s a lot of tie-in and bouncing off of Star Trekwith Heroes. ?With Heroes, one never knows what?shappening,? 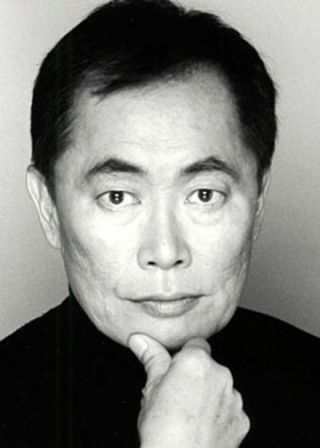 Takei adds. ?There?s nothing on the surface that?s as it seems.When my character was pushed off the building, I thought well, that was a funrun, but I guess that?s it. Then other scripts started to come. After all, I?mthe father of a time travelling son. So I?ve been making appearances. Who knowswhat?s going to happen? Only Tim Kring and the writing staff will determine.? One thing Takei does hopeis that he returns. He certainly enjoys the star treatment he gets on the show. ?They?re veryaccommodating,? he notes. ?I got married last September, and they arranged myscenes to be after my honeymoon. They skirted around my scenes until I cameback.? As for his possible returnto either property, he?s keeping his fingers crossed. ?The Clone Wars is, in some ways, like Heroes,?says Takei. ?You don?t knowwhat?s going to be happening in the future, and then the script comes. With Heroes, when I was originally cast Ithought my role was only going to be about a father/son relationship with metrying to keep up with this weirdo son who suddenly jets to New York for noapparent reason. Then one day a script arrives and it has a scene with mecarrying a baby and it turns out to be baby Claire that I hand over to HRG toraise. That?s when I had to realize there was more to this character than Ithought. Then other scripts come and I discover there?s more. I?m involved withanother generation with powers. ?With Clone Wars, it?s the same thing. The nextscript brings what the next script brings, and Lok Durd is an absolutelyfascinating character. He?s certainly a unique adversary with a unique approachto using technology. So anything can happen. I?m waiting for the next script.? Not that Takei isn?t keepingbusy. Before coming to the interview session, he had just come from doing someTV commercials. Afterwards he was off to Canada. ?I?m going to Edmonton,Canada to narrate a symphony that has to do with science fiction,? says Takei. ?The music is from sci-fi and fantasy-related movies. Themes from Star Trek and Star Wars will be performed. I?ll bedoing that in Ottowa as well. So that?s another space-oriented kind ofextension of my voice work. I?m in conversation on a stage play in London.Being it?s only in conversation, I?ll only hint at it.? It doesn?t take muchprompting to get the man to talk about the theater. Like a lot of old schoolactors, he?s totally enamored with it. ?What we haven?t talkedabout is theater work,? he brings up. ?My soul really resides and thrives intheater. If you know the play Equus,I did Dysart here in Los Angeles. Dysart is the psychologist who was originallyplayed by Richard Griffith opposite Daniel Radcliffe better known for playingHarry Potter. Richard Burton played him in the film version. Leonard Nimoy alsodid it on Broadway. I think he followed Richard Burton. On Broadway, it wasfirst done by Anthony Hopkins. Then Anthony Perkins played him. I first saw itin London, with Anthony Hopkins as Dysart. I never thought I would get a chanceto do that role. ?I also was in Pacfic Overtures all over. Another stagerole I did in New York that I really enjoyed was entitled Year of the Dragon by a Chinese-Americanplaywright named Frank Chin. It was the first time I can remember that as anactor I was able to use my experience as an Asian-American in my work. It waslater taped for television for PBS, so it can be seen.? Takei has also been on televisionfor other reasons. He?s been actively campaigning against California?sProposition 8, which could potentially dissolve his marriage to Brad Altman. ?As you know, it?s beingchallenged,? says Takei. ?I?m confident it?s going to be overturned because itproposes to amend the constitution of the state of California simply by goingout and gathering signatures. Then putting an initiative on the ballot andgetting fifty percent of the vote plus one to amend the Constitution. ?That?s not how the Constitutionis legally amended. There is a whole process. Both houses of the Californialegislature have to approve it by 2/3?s majority, not fifty percent plus one.That?s 2/3?s vote, both in the California House and Assembly. Then it goes onthe ballot. Also, the voters have to approve it by a 2/3?s vote. ?We got married when theSupreme Court of the State of California said there was a fundamental right forall people to be married,? says Takei. Now the attorney general of California,Jerry Brown, is challenging Proposition 8 as well. He knows his way around thelegislature, being a former governor and all that. ?There?s now something like18,000 marriages that happened after the Supreme Court initially acted in May.It became in June. We got married in September. The vote happened in November.There?s no way those marriages are not going to happen.? It only leads one to theconclusion we?ll be hearing from Takei one way or another, whether is in GeorgeLucas? greatly expanding universe, somehow from Star Trek, or invovled with thecourts of California.